We recently headed to Bordeaux for a press trip with a selection of luxury lifestyle journalists and foodie writers for a stay at the stylish Hotel Le Saint-James. During our stay, we got creative in the kitchen under the guidance of Célia Girard in the cutting-edge Cote Cours cookery school. Not only did we learn new culinary techniques, we were also educated on the perfect combination of flavours and the creative plate presentation Le Saint-James is renowned for. 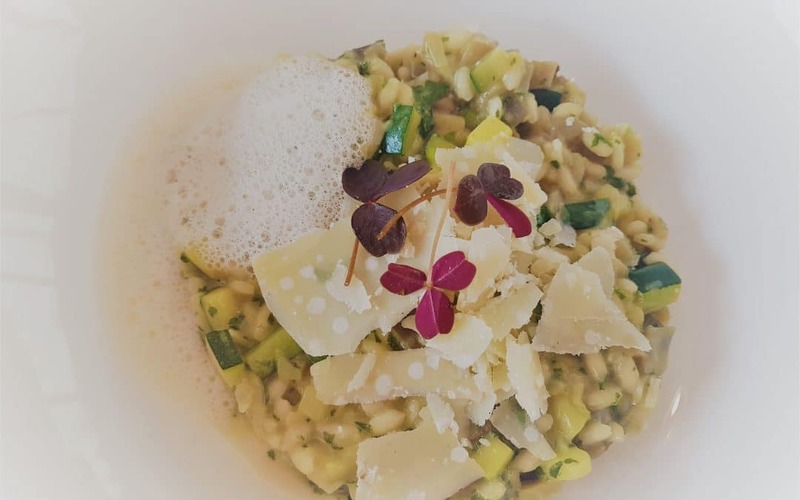 Between us, we crafted a delicious Mediterranean risotto with parmesan emulsion. If you’d like to try your hand at a little French cuisine, we were lucky enough to get hold of the recipe. Prepare the vegetable stock and set aside. Blanch the basil leaves in boiling salted water, then place into iced water. Press to remove any excess liquid. Mix with a clove of garlic, a dash of olive oil, parmesan cheese and a few drops of lemon juice. Check the seasoning and set aside in a cool place. Cut the zuchini and eggplant in thin strips, then fry with a little olive oil. Put into the fridge to keep cool. Heat a pan with some olive oil, add the chopped onion, crushed garlic clove and sprig of thyme. Deglaze with white wine. Pour over the stock and add the parmesan cheese. Cook for 10 minutes. Strain, reduce then add butter, milk and soya lecithin. Chop the onion and sweat in a pan with a little olive oil. Add a knob of butter and the risotto. Deglaze with white wine then pour on the hot vegetable stock, gradually, cooking for another 20 minutes. When the risotto is cooked, add the vegetables and finish with mascarpone, grated parmesan and pesto.